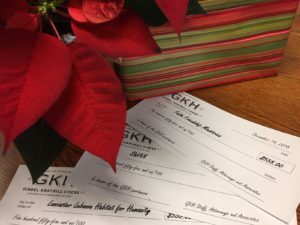 GKH has a long-standing holiday tradition of honoring the partners with donations in their names to several local charities. This year staff and associates gave a total of $1,665.00 to the following organizations: Lancaster Lebanon Habitat for Humanity, Swan, and Faith Friendship Ministries. Lancaster Lebanon Habitat for Humanity builds, renovates and repairs homes throughout Lancaster and Lebanon Counties, pursuing a vision of a world where everyone has a decent place to live. Swan: Scaling Walls a Note at a Time is a support group for children affected by parental incarceration. It provides free music lessons, mentoring, and performance opportunities. Faith Friendship Ministries provides those with serious mental health issues affordable, high quality residential opportunities. Their goal is to provide every resident the tools they need to lead a successful and fulfilled life. We extend a hearty “Thank you!” to these organizations for the good work they do in our community.